Globalcom with it's self acclaimed "Grand Masters Of Data " are on it again as they have added new set of data plan for heavy download internet users . This new data plan features a 180GB data at the rate of N20,000 which is very suitable for firms , cyber cafe and other organisations that requires heavy data . 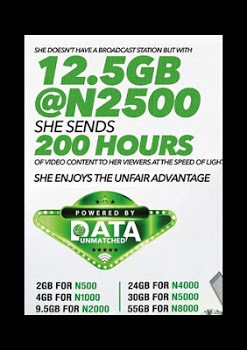 This new data plan gives you 2GB for as low as N500 , 4GB for N1000 and so on , to be honest Glo are trying in terms of very cheap data plan , the only issue is with their network which is gradually improving . HOW TO GET THIS DATA PLANS . Just Dial *777# and follow the prompt . What do you think of this new plans ?